Bed measures 78 x 54 inches; total length of 118 inches. Accommodates up to two adults (450-pound maximum). Space-Saving Steel Stand, Created for long life and stability, the stand is made from heavy gauge steel. 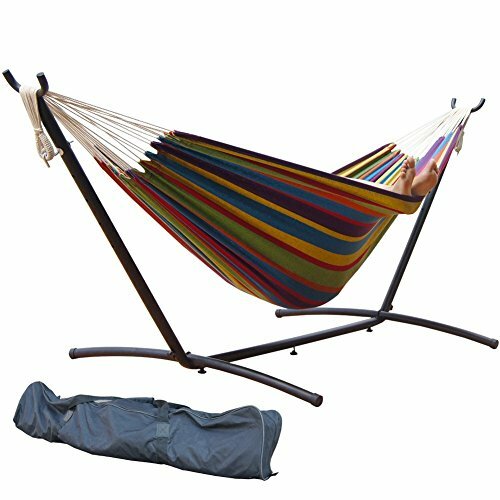 It assembles easily in minutes, with no tools required.The well-designed heavy duty steel stand gives you a sense of security to enjoy your slumber, the entire hammock combo can be easily maneuvered around your backyard or patio. Powder coated in either a charcoal or oil rubbed bronze finish, the stand measures 9 feet in length. All ends are finished with plastic caps. The stand is easy to disassemble for storage or travel, and comes with its own carrying case. Bed Length： 9 ft. 8 in. Bed Width： 4 ft. 9 in. Prime Garden LLC is a outdoor leisure products company which mainly focus on online retail and wholesale patio furniture and outdoor living products. We do not only sell the furniture and outdoor living products, but also design, manufacture and distribute the products we sell. Prime Garden supplies you a wide variety of outdoor furniture and other living products choices including outdoor patio conversation set, outdoor deep-seating groups, outdoor bar and pub collections, garden benches, patio umbrellas, outdoor loungers, hanging chairs, premium hammocks and stands and many other unique accessories to enhance your outdoor experience. The colorfast 100% cotton hammock comes in vibrant shades. The stand is made of durable steel with a powder-coated, charcoal finish. The stand is easy to disassemble for storage or travel.Easy to assemble and move. Accommodates two adults,Max weight capacity of 450 lbs. If you have any questions about this product by PG PRIME GARDEN, contact us by completing and submitting the form below. If you are looking for a specif part number, please include it with your message.